Kandy Couture – Add a touch of decorative magic to your event. 27 Jun Kandy Couture – Add a touch of decorative magic to your event. 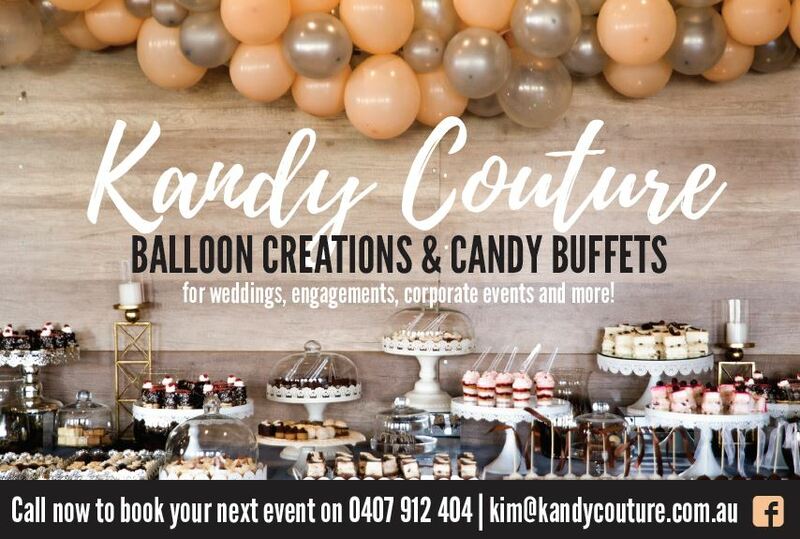 KANDY COUTURE ARE THE ONLY SPECIALISED CANDY BUFFET COMPANY IN GLADSTONE AND THE SURROUNDING AREA. We create custom candy Buffets and Balloons for weddings, corporate events, christenings, birthdays, Grand Openings and more; the ultimate way to create a customised and special experience for your guests. No matter the event type, we can help make your day extra special! A candy buffet is a modern way to celebrate with your guests. Creating the perfect lolly bar involves a touch of decorative magic; with the help of our professional staff, the candy bar will be unforgettable. Our staff keep up with trends, using their creativity to customise each display. Making your event unique can be a challenge, but Kandy Couture is dedicated to presenting an original lolly bar design that matches the theme and mood of your event. Candy buffets can be bright and child-like or sophisticated and decadent – whatever the requirement, you can rest assured we can supply a lolly buffet to match. Kandy Couture provides a combination of classic and contemporary lollies housed in stunning apothecary glassware with lolly scoops that smack of yesteryear. Our tablecloths are also specially selected to ensure that the candy buffet serves as the perfect backdrop to your event. Provide a little of the unexpected for your next corporate event with a candy buffet. Designed to match your company colours or your event theme, a candy bar will create the atmosphere you are looking for. We can customise colours with candy, Balloons and your company Logos. Your guests have wined, dined and danced and for many weddings, the function has run out of ideas. Roll out the wedding candy buffet! Guests of all ages will flock to it, cackling away as they fill their lolly bags or lolly boxes with forbidden goodies. If yours is a kids party, don’t even bother trying to hold the kids back! Let them pack their own lolly bag that they can then collect at the end of the party. And as for the theme, be it “Under The Sea”, “Super Heroes”, “Hollywood Rockstar” or “Halloween”, Kandy Couture will supply a buffet to match.